A teenager has pleaded guilty to starting a fire in the cellar of his own home in Halifax. In March fire crews from Brighouse and Odsal were despatched to tackle the early hours blaze after a smoke alarm was activated at the property on George Street, Hipperholme. The fire crews attended at the scene at 2.30am and spent about two hours dealing with the aftermath of the fire which is understood to have caused mainly smoke damage. Today 19-year-old Ruairi Moore admitted a charge of arson being reckless as to whether the life of his mum Nicola Watson would be endangered. 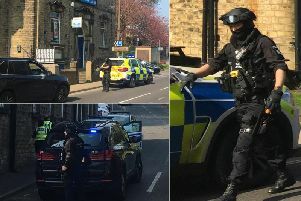 During the brief hearing at Bradford Crown Court Moore’s barrister Stephen Wood said the teenager had no previous convictions and he would be obtaining a psychiatric report on his client before he was sentenced. Moore, who is on bail and still living with his mother, will have to return to the crown court on December 1. “Your case will next be before the court on the 1st of December for sentence and you must expect the court to be considering a custodial sentence in your case, you having pleaded guilty to what is a serious offence,” Judge Peter Benson told the teenager.